Sewer Line Clean Out - Bay Area Plumbing, Inc. If you own a home or business in the Tampa Bay Area it is important to know that under the State of Florida’s plumbing code it is required that a Sewer Line Clean Out be installed on the plumbing system of your structure. It is also important that you know where this clean out is located, which is where your main sanitary building drain exits your structure. This is where the sanitary sewer starts and where a sewer line clean out should be installed within 3 feet from the building on what is called the lateral sewer. It is also important to know that there may be several of these installed and that there should be one located near the city or county sewer tap location on or near the property line. It is also required by code that one be installed every 75’ providing several access points and allowing for proper maintenance and upkeep. What Is A Sewer Line Clean Out? A sewer line clean out is a vertical pipe which has one end connected to the lateral sewer line that runs underground connecting a residential home or commercial building to a public sewer line. The other end of this vertical pipe extends to the ground’s surface where it is capped. 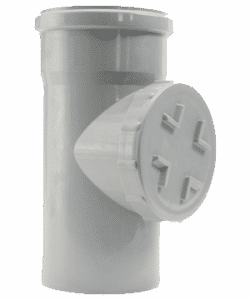 This cap can be screwed off allowing easy access to the buildings sewer line for maintenance purposes and it also serves as a great way for easily locating the buildings’ sewer line in cases of emergency when quick access to the sewer line is needed in order to prevent the sewer line from backing up into a building or a home. If the main building drain clogs up or overflows, the owner can go outside to the sewer line clean out and unscrew the cap to release the water and help prevent it from backing up into the building. For this reason the capped end should remain visible on the grounds’ surface and not be obstructed by any objects which would make it inaccessible when quick access is needed. The cap can usually be easily unscrewed using a wrench or sometimes even by hand if it was not previously tightened down hard. What Are The Benefits Of A Sewer Line Clean Out? There are a number of benefits to having a sewer line clean out installed. One of the benefits is that it provides a great access point that allows you or your plumber to rotary clean or jet clean the main sewer or building drain from the outside of the building or the home. Having a sewer line clean out installed outside a structure provides a better location to perform a cleaning of the sewer line rather than pulling your toilet or getting up on the roof and because of this, it saves the owner money if they are hiring a professional plumber to perform this task for them. In addition, when you have a sewer line clean out installed, the sewer lines in your building or home can be tested at each plumbing sink or drain location in the building to verify all drains are flowing correctly by a visual inspection through the clean out. We recommend that all those who own a building or a home install a sewer line clean out so they can keep up with their plumbing maintenance, help prevent floods and thereby keep plumbing cost down. If you already have one installed, we recommend that you locate it so that you know where it is in the case of an emergency where quick access may be required. For further information regarding sewer line clean outs, please feel free to contact us at (813) 837-8666 or (813) 620-0044. You can also contact us via our contact page.